The more warmth and sunshine an established basil plant receives (up to a certain point) the better it grows. In the UK, Aberdeen has a significantly longer period of daylight compared to Bournemouth in the summer months. However, basil is more likely to grow successfully in Bournemouth. So the length of daylight is clearly not a significant factor in the UK. Natural temperature highs and lows are however very significantly different between areas in the UK. Not only does this favour warmer parts of the UK but it is also an important factor in deciding when to sow seed / take cuttings and where established basil plants can be grown. An exceptionally good reason to adjust dates in this article (and the entire website) to your home town. Basil can be propagated by the amateur gardener in two ways, from seed or from cuttings. Cuttings have a couple of advantages over seed but also one major drawback. At the time of year when you want to take your first basil cuttings you probably won't have a plant to take cuttings from - a major disadvantage! You can buy a pot grown plant from your local supermarket at any time of the year and that's probably the way forward as far as cuttings are concerned. However that's where seeds show their key advantage. Whereas the pot grown basil from the supermarket will almost always be sweet basil, you can grow several different types of basil if you buy seeds. So the choice is yours and we describe both methods in detail below. Towards the end of this article we also describe the taste and uses of the different types of basil that can be grown from seed. Basil thrives on lots of sunshine and light, this description is aimed at growing basil in the spring and then placing it outside when the weather is warm. 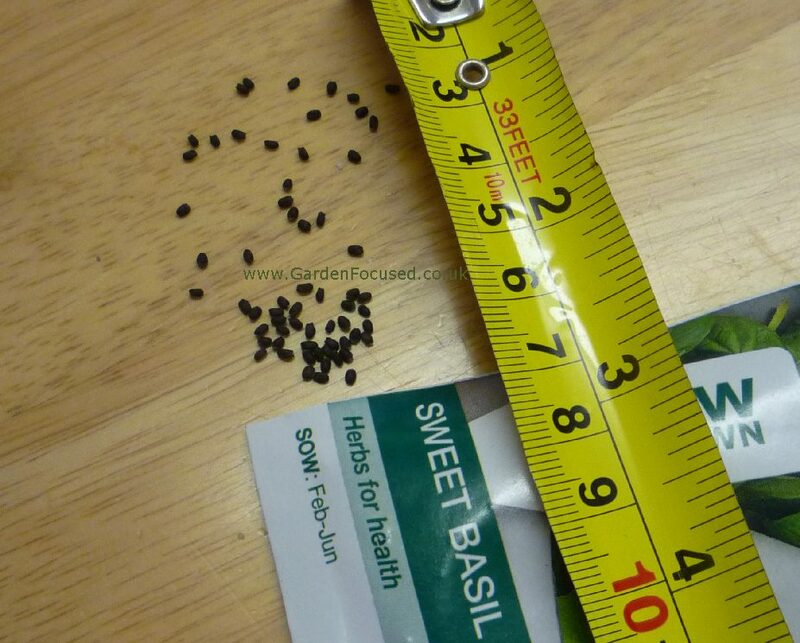 If you are sowing basil seeds for growing on the windowsill throughout the summer then you can sow the seeds earlier. How much earlier depends on many factors so we suggest you try sowing a couple of weeks earlier and see how the plants grow. You can then adjust the timing to sow earlier or later depending on your success or failure. The best time to start sowing basil seeds is the first week of April 2015 (UK average). Click here to personalise dates in this site to your town. The seeds germinate well as long as they are sown into moist compost which is kept at around the ideal temperature of 70°F / 21°C. A good pot size to start them off in is 8cm / 3in wide. Fill the pot nearly to the top, place three seeds on the compost and sprinkle a thin layer of compost over the seeds. Gently pat the compost down. Loosely cover the top of the pots with cling film or a plastic bag - enough to keep the moisture in but also to allow some air circulation. Water from below with lukewarm water. A centrally heated house is normally about the correct temperature for basil to germinate. 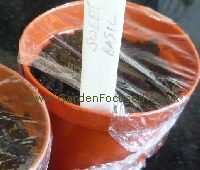 The seeds do not require light to germinate so initially they are best kept away from windowsills to maintain the most even temperature possible. 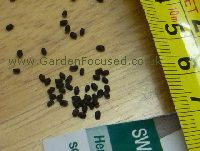 Basil seeds can geminate in as few as three days (ours took only four days) but normally take 10 to 14 days to germinate and appear as seedlings. 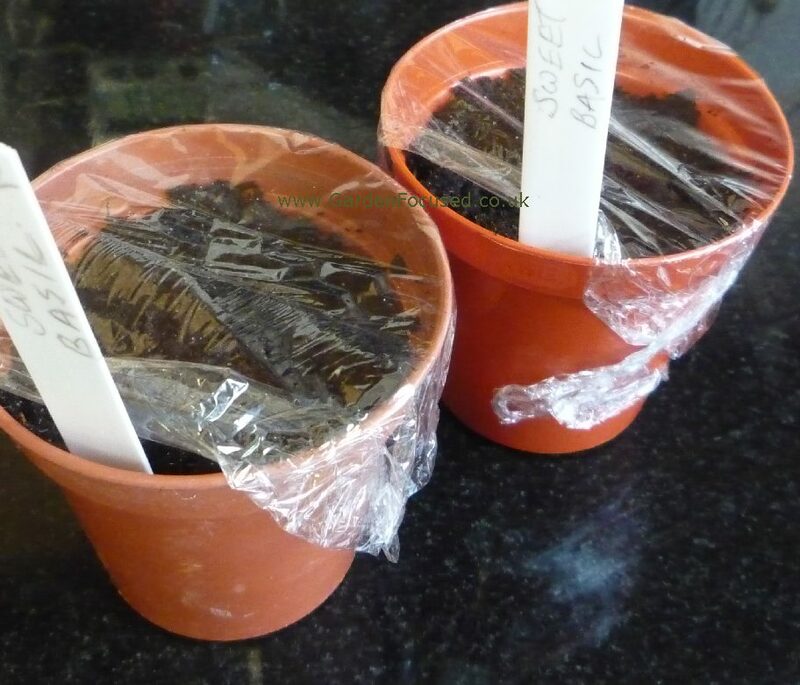 Keep an eye on the pots daily and as soon as the seedlings appear move them to a light and airy position indoors and remove the plastic bag / cling film. Do not place them in direct sunshine, basil doesn't appreciate full sun when they are young plants. A windowsill is often a good place to grow your basil but make sure that it is free from draughts - some windows, even double-glazed ones, sometimes let small draughts in and basil hates draughts. All the time you are growing basil indoors the light will coming from only one direction and the plant will tend to grow towards that light. To stop this happening turn the pot daily about a quarter of a turn to ensure the growth is not all in one direction. Taking basil cuttings is a very easy way to propagate this herb and you end up with plants that can be harvested earlier compared to seed grown basil. It's also a great project for young children to undertake because not only can they see results in a couple of weeks but they will also be able to see the roots growing day by day. The process is simple and to guide you through it we have created a special page dedicated to taking basil cuttings in water which can be found if you click here. It has step by step pictures from beginning to end. WHICH GROWS QUICKEST - CUTTINGS OR SEED? 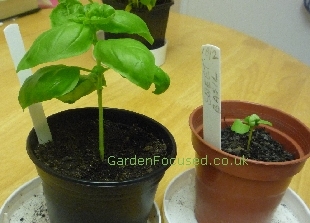 As can be seen from the picture below, basil cuttings are by far the quickest method. The plant on the left is a cutting and the plant on the right is a basil plant from seed. They are both about four weeks old. In fact, the basil cutting has grown so quickly that it can now have the top two sets of leaves cut off to encourage it to grow into a bushy plant. Basil not only can't stand even a degree of frost but it really needs a minimum temperature of 15°C / 59°F if it is to grow healthily. 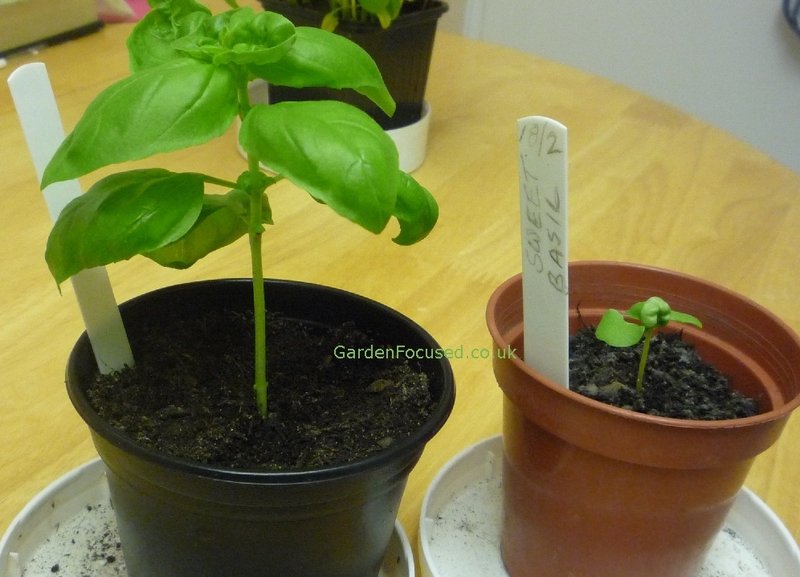 With that temperature in mind start to harden off basil in the third week of May 2015 (UK average). Hardening off basil will take about two weeks and you will be slowly exposing the plant to outside conditions for slightly longer times every day. During the hardening off process do not place the plant in full sun which can damage the leaves. Keep the plant out of draughts but in a light and airy position. Basil is a sun and heat loving plant when it is established and that's the key to choosing a good position for them to grow. You have two choices when planting out basil, either in open ground or containers. We would recommend always using containers in the cooler half of the UK and it's also ideal in all areas. If you are in the warmer parts of the UK and you can provide a site sheltered from wind then basil can be planted in open ground. A key benefit when using containers is that they can be moved around the garden as weather conditions dictate. If you are planting your basil in open ground dig the soil to a fine tilth about a spade deep. If the soil is at all clay based add lots of organic matter and dig that in well. Unless your soil is naturally poor in nutrients don't add any feeds to the soil, basil tastes better and grows better when the soil is slightly low in nutrients. Planting is the same process into pots or open ground. Make a hole in the soil / compost about the same size as the pot. Remove the basil from the pot trying your best to disturb the roots as little as possible, place the root ball into the hole to the same depth as it was in the pot and fill in with soil / compost. Firm the soil down lightly to remove any air pockets. Water them in well. Basil is very easy to care for, weeding when growing outside is clearly beneficial. As far as watering goes, in pots and outside, keep the plants on the dry side and the same goes for feeding them - normal soil / compost should be sufficient. Regular harvesting is the key to creating a bushy and healthy basil plant, it really is the most important part of caring for your plant. We explain the process in detail below. When your basil plant first starts to grow there is a temptation to let it establish itself before harvesting any leaves and this is the wrong approach. All stems, and that includes the first central stem, should be "pruned" when four sets of leaves have formed. 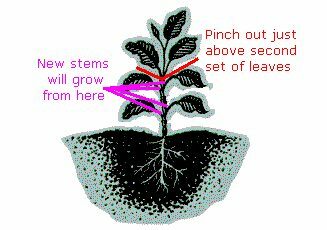 Trim the stem to just above the second set of leaves which will encourage shoots to appear from the two remaining sets of leaves. Our very amateur drawing below explains in a more graphic manner. As secondary shoots appear prune them in exactly the same way after the fourth set of leaves has formed. If you notice any flowers beginning to form, prune these away immediately because if left to grow they will cause the plant to stop producing leaves. There is some disagreement as to when is the best time of day to harvest basil, the morning or evening. Our vote goes to as late in the day as possible - Michigan State University have conducted tests on basil and late in the day harvests produce basil which keeps best. When harvesting basil, cut the stems off not just the leaves to encourage quicker and healthier growth. If you want to preserve your basil leaves by drying we have four different methods methods for you to choose from. Click here for our guide to drying basil with step by step instructions and pictures. As with all grow-your-own plants, taste is key as is the knowledge that the produce has not been sprayed with masses of unknown chemicals. But another factor is cost - is grow-your-own basil cheaper and more convenient compared to the shop bought equivalent? So, grow-your-own basil is not only chemical free, much more convenient it can be harvested at any time in your garden) and far fresher, it is also far less than the cost of supermarket basil. That has to be good value especially when you consider that basil makes a very attractive plant which looks great on a window sill or in the garden. The commonest of all the basil varieties, it is also known as sweet basil. Sweet Genovese has the distinctive basil taste and scent known the world over. When a recipe calls for basil, use this variety. Widely available as seeds and as pot grown plants, our supplier is Victoriana Nursery. There are endless variants on the basic sweet basil and in our opinion some of them are novelty plants. If you want to experiment however, try this page for some unusual basil varieties.